We had a great time honoring the 50th reunion class. Congratulations, Class of 1968! Visit the photo gallery to see photos of yourself, your friends, and others from that historic class. 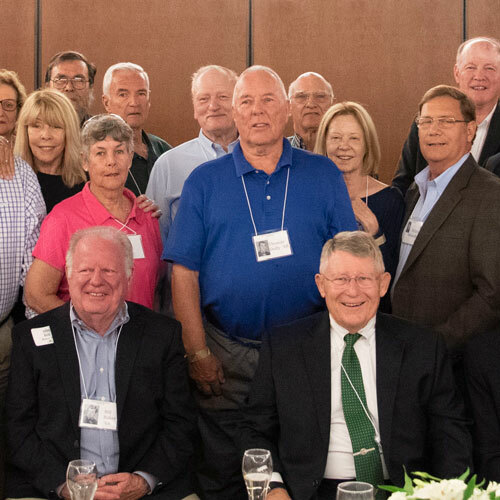 Members of the Class of 1969 will be gathering November 1-3, 2019, to celebrate their 50th reunion. Be sure to save the date! Excited about your reunion? Join the planning committee by contacting Sarah Olsen at (352) 588-8729 or sarah.olsen@saintleo.edu. Contact the Office of Alumni Engagement and Sustained Giving at (352) 588-8667 to confirm your attendance and help promote your 50th reunion celebration at Homecoming. Previous classes have set the bar for reunion class giving. Let's see what you can do! Your 50th reunion class gift, and those of the classes that follow, will go toward the Legacy Scholarship, which will provide annual scholarships to assist rising seniors as they complete their degrees. Your example of philanthropy will inspire other classes to continue the tradition. Please be sure to ask for the Saint Leo University discounted rate.